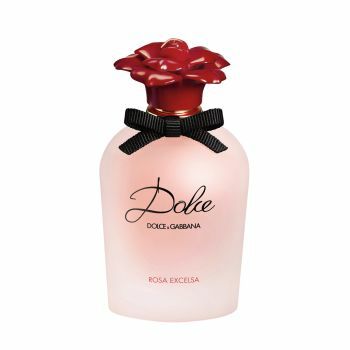 The bold and pure spirit of the rose is captured in full bloom with the Dolce&Gabbana Dolce Rosa Excelsa Eau de Parfum, an exquisite creation for women. The new fragrance in the Dolce Garden seduces the senses with two noble rose notes: the enveloping beauty of Turkish rose absolute and the African dog rose, used for the first time in perfumery. This romantic fragrance opens with a burst of lively neroli leaves and papaya flowers, joined by the pure floralcy of white water lily and white daffodil. In the heart, a combination of Turkish rose absolute and African dog rose unfurls with characteristic charm, before a dry down of warm musks, cashmeran and sandalwood creating a sensual embrace.